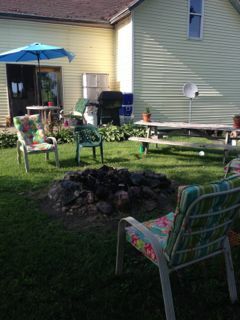 Tony welcomed me to his quiet rural acreage garden. He lives about 10 minutes outside Chetek, Wisconsin, which is in the northwestern part of the state. 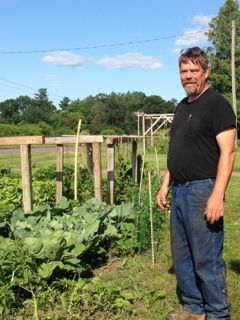 He has lived on this one acre property for the past 25 years and said there has always has vegetable gardens, however it has just been the last few years that he has become more interested in planting and caring for the veggies. He was generous to say my website has been helpful to him. He admits his girlfriend has much more knowledge and know how than he has, however his passion comes through when he talks about the garden and planting of the veggies. 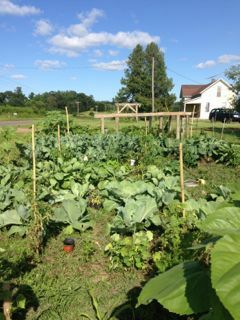 Tony is passionate and committed to growing his food organically. He believes it is healthier and vegetables taste so much better than the store bought ones. 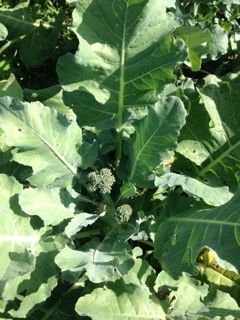 He admits that food is fairly cheap so growing it does not save much money overall, but you can’t beat picking and eating fresh food! 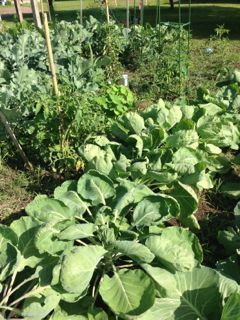 The area he grows in was once a cow pasture, so the soil is rich humus, perfect for growing vegetables. 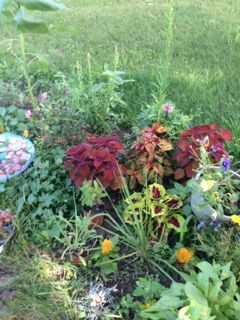 This year he has planted tomatoes, lettuce, cabbage, broccoli, cauliflower, Brussels sprouts and intermixed herbs among the plants for companion plants. 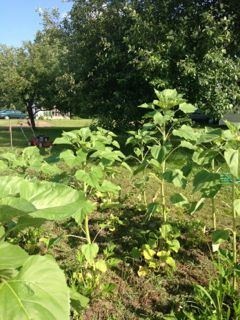 The area is not fenced but it is surrounded with sunflowers. Do they keep the deer out? He does not seem to have a problem with deer and there are definitely in the areas, so maybe sunflowers are the answer? The tomatoes were tied to a post for vertical growing. This is a great way to add air circulation around the plant and to keep the fruit off the ground. 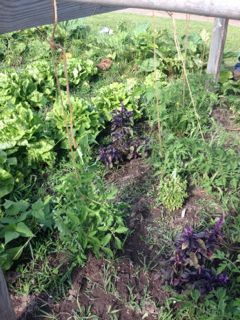 Overall the plants were very lush and it looked like a happy veggie garden. 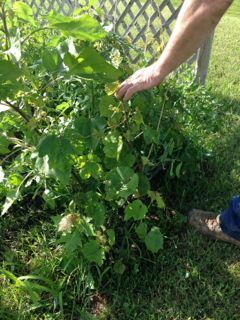 In a smaller arbor type structure on his rural acreage they were growing grapes, more tomatoes and beans. I asked what does he do for the grapes over winter? He said he just cuts them back at the end of the season, mulches them well and they always come back in the spring. The greenhouse was originally a cow milking shed. It was falling down so he removed the roof and walls and covered them with coreagated plastic, which stands up well to the snow and cold winters. 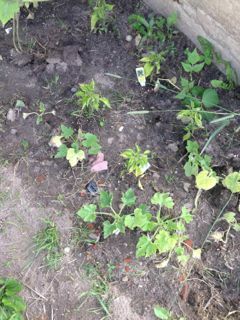 The cucumbers and tomatoes are growing in a cement trough, which was once used to place the pails of milk to keep cool. The plants seem to love the spot. The tomatoes were considerably bigger than the plants outside. 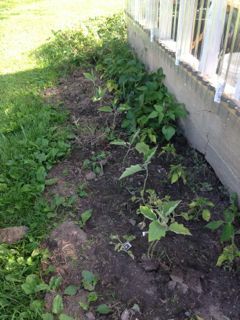 Tony said his cucumber plants (only 4 of them) usually take up half the greenhouse and produce very well. 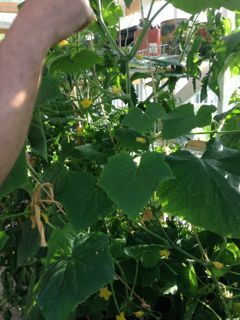 He plans to do more container growing in the greenhouse and one of his goals is to be picking tomatoes during the winter months. 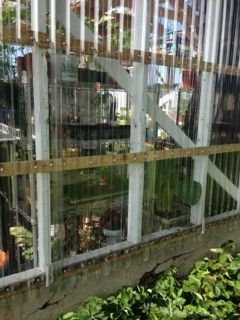 He has plants growing around the outside to the greenhouse as well. 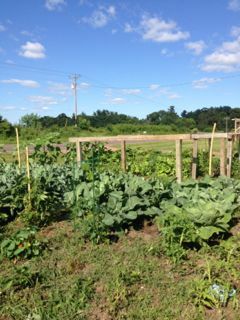 The zucchini, eggplant, melons, and beans like the sheltered and warm area on this rural acreage. 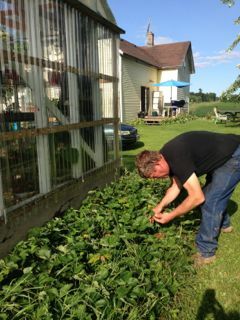 He moved his strawberry patch to the area just behind the greenhouse and from that 4 by 8 foot area he picked 2 full huge salad bowls full of berries this year. A very productive strawberry year. There were even a few more for me to munch on. He starts all his own seedlings in the greenhouse usually starting in late March as he does not plant outside until late May. One year he was pain stakingly planting one seed into an individual 72 cell tray, when his girlfriend suggested an easier way. He now fills an aluminum tray with starter soil and broadcasts the seed, once the plant is about 3 inches high he transplants it into its own pot, then plants outside from that pot. So much easier and less tedious. He makes his own compost and has access to lots of horse manure. Every year he gets a pickup load of manure and tills it and the compost into his garden beds. 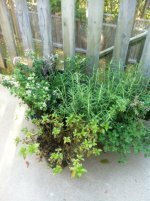 He has very few pest, insect or disease problems with his plants, in my opinion the rich healthy soil has a lot to do with this. 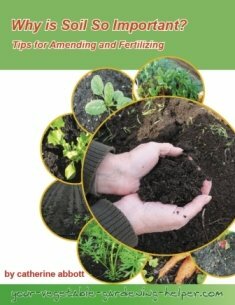 Feed your soil, and the soil will feed and keep you plants happy, this is a true organic motto. 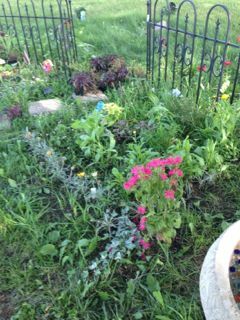 His girlfriend has also made some beautiful flower gardens around the house. The road allowance is changing in the front of his property, so he is forced to move his garden to another area on his rural acreage. He is surrounded by corn and soybean fields that are grown totally with chemicals. Right now the garden is next to one of these fields and he is concerned the wind is carrying pesticides over into his veggies, so moving it will perhaps help with this as well. Since his garden soil does such a great job he plans to dig up the soil and move it to the new garden area, he just has to decide where that will be. Tony was generous enough to grill me a couple burgers for dinner. While he was doing that I was able to listen to the music of the beautiful aspen trees, birds chirping, a humming bird flying around and as I sat at the picnic table watched a deer hopping through the corn field - a beautiful quiet peaceful rural acreage garden. I had to ask since I noticed in the area the street names had a number and often a ¼ and ½ along with it. His address was 4 ½ Avenue. He told me the county he lives in is totally square. One border is 1st Avenue the other end is 30th Avenue; the other borders were 1st Street and 30th Street. Address were given the exact distance they are from the county lines. He is 4 ½ miles from the county line. This makes it easy for 911 calls to know where the exact location is. I thought this was an interesting tidbit to share. Thanks Tony for the warm hospitality.